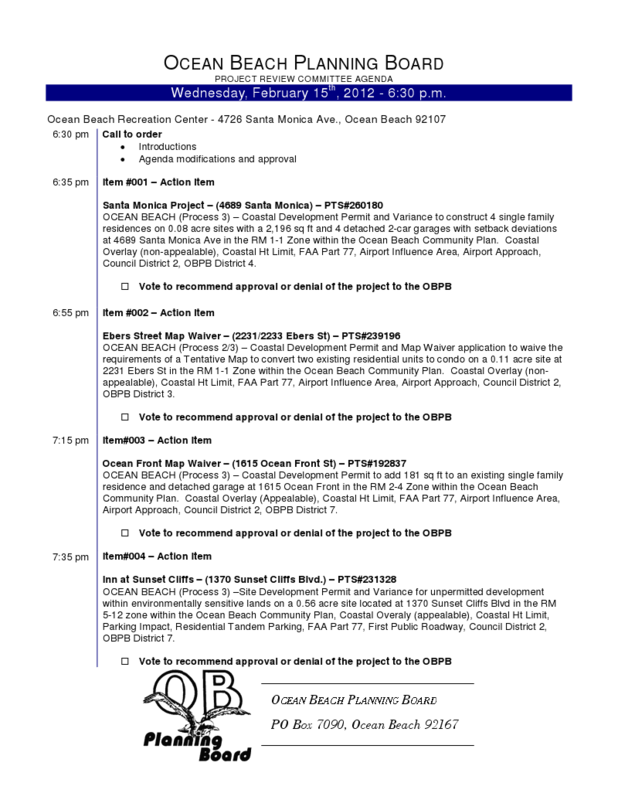 Here is the agenda for the OB Planning Board’s Project Review Committee hearing on February 15th. The meeting will be held at the OB Rec Center at Santa Monica Ave. and Ebers. The Project Review Committee reviews all incoming proposed projects and sends on a recommendation to the full Board. The full Board meets the first Wednesday of every month. and Item #4 is the more controversial action item concerning the Inn at Sunset Cliffs located at 1370 Sunset Cliffs Boulevard. Action Item #5 – Douma Residence – (5168 West Point Loma Blvd) – JO#236671, OCEAN BEACH (Process 3) – Coastal Development Permit, Neighborhoods Development Permit for Environmentally Sensitive Lands and a Variance to Demolish an existing duplex and construct 1,693 square foot, three story, single family residence with reduced dedicated parking area on a 0.05- acre site. The Property is located at 5168 W Point Loma in RM-2-4 Zone within the Ocean Beach Community Planning Area, Coastal Overlay Zone (Appealable Area), Coastal Height Limit overlay Zone, Airport Approach Overlay Zone, Federal Aviation Administration (FAA) Part 77 Noticing Area, First Public Roadway, Historic District-Ocean Beach Cottage Emerging District, Parking Impact Overlay Zone (Coastal and Beach) and Residential Tandem Parking Overlay Zone, and Council District 2. OBPB District 1. The planning board is only as strong as we, the people who care about OB’s future, make it. If we show no interest or concern and express no opinions, then the OBPBs recommendations to the city have no teeth. It is important to understand that the OBPB has very little power unless we give it to them by our actions. So we must attend meeting, and, if we can’t, contact the OBPB members-in writing-to express our opinion. That way, when they go to the city to recommend a certain course of action, the city will hear them. Presently, some of OB’s longstanding building guidelines that were painstakingly laid out in order to preserve the OB specialness are being ignored and violated. Builders and interested party’s can get special dispensation to build what they want with just a little effort. OBPB can not fight these efforts and say “this is not what the people want” without producing evidence. Presently they can’t produce evidence because so few people attend the meetings etc. This is an important meeting to all of those who care about Ocean Beach and have a desire to make sure that the developments that occur here are in the best interest of the majority and not just those who stand to make money or the wishes of a few. I do NOT want to go. My favorite day of the week is Wed. because I sit in a local drinking establishment and watch the fun of our Farmer’s Market. However, even with a few beers in me, I know my presence is important. I don’t have to say anything, I just have to express interest by being there. The meeting will probably be pretty boring but it’s the least I can do to win my right to complain later. Hopefully I’ll see some others there tonight. I’ll be at the Harp until 6:20 pm-meet me there if anyone wants to walk over with me!